Humayun was the second Mughal emperor who ruled initially from 1530 to 1540 and then again from 1555 – 1556. The empire he inherited was very unstable and lacked strong administration. It attracted aggression from external forces like the Afghans, Rajputs, etc. His biggest rival, Sher Shah Suri, defeated him in the battle of Kannauj (1540), leaving him with no option but to leave India and escape to Iran. The Mughal Empire remained inactive for a period of nearly 15 years. Sher Shah Suri established his own dynasty. In 1555, Humayun came back with a strong force and recovered his kingdom. He ruled over most of India, Pakistan and Afghanistan and was an efficient ruler. Humayun was inclined towards the finer things in life and was not a very fierce warrior. Though Humayun managed to get his kingdom back, he couldn’t rule for long. One day while coming down from his library, he slipped and fell down the stairs. He suffered massive injuries and died a tragic death. The kingdom was left with his son Akbar. 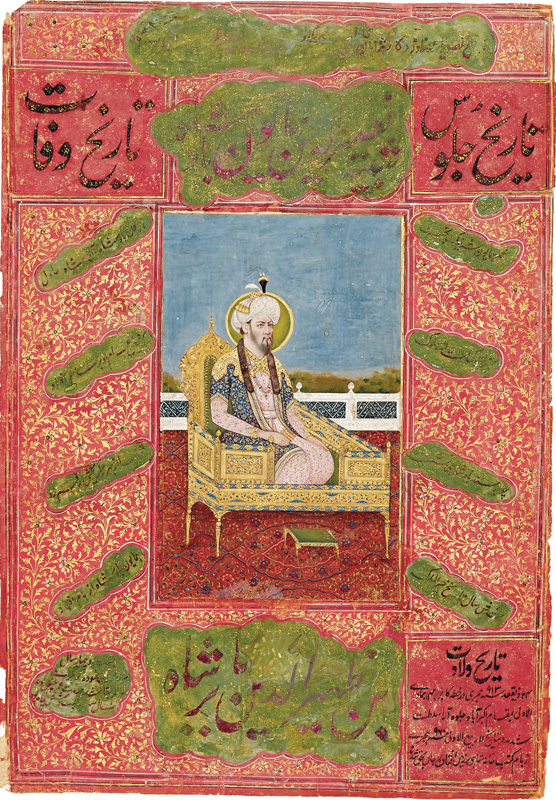 In this portrait, emperor Humayun is kneeling on a golden throne. The green halo outline with gold, gives his turban a good contrast. His puffy face and thickened neck reflect the Emperor’s indulgent lifestyle and mature age.